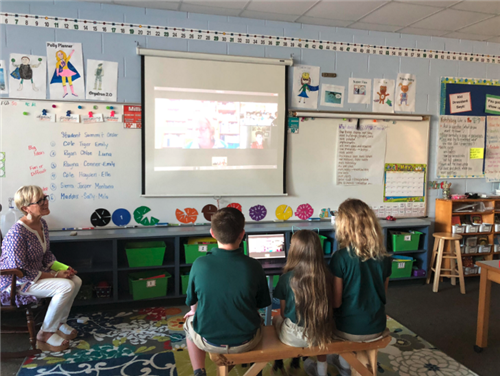 Shorecrest fourth graders connected with students in Egypt, Nepal and Thailand via Windows to the World, on online global project that develops writing and digital citizenship skills, as well as focuses on cross-cultural competency and collaboration. Using Edmodo, students communicate with one another across the globe and work together in cross-classroom groups to share and discuss their respective cultures. Fourth grade teacher Jane Boarman recounts, "We kicked off the project with a virtual handshake in which the students introduced themselves and talked about their school and city in a short video. Then, the students worked in small groups on the Edmodo platform to communicate with one another on a variety of topics. Last week we exchanged ideas about food and this week, the topic is climate, geography, and the environment." In the final activity for the Windows to the World project, each small group (including students from Thailand, Egypt, and Nepal) created a multi-media work to share what they had learned about the four topics: food; festivals and celebrations; climate, geography and the environment; and pets and native animals. Their collaborative works are published on their Windows to the World website. "In this project, we are learning to write about our own culture, ask questions, compare different experiences, and comment on other student's writing in a positive and informative way," says Mrs. Boarman. As the project came to an end, the students exchanged their final ideas using a meeting platform called Fuze. Mrs. Boarman says, "Some of the big ideas the students took away were that although our distance apart was great, we were close in terms of learning with one another and collaborating on the final project. Another classmate thought that we had truly opened our windows to allow others to look in, and we, in turn, had been able to peek into windows in far away places. As we talked about what we wanted to say during the summit, we observed that while the differences were apparent, the number of similarities was a surprise - 'We are more alike my friends than we are unalike.'" The students also identified what was enjoyable and what was difficult about doing a project involving so many people in different parts of the world. Last, they brainstormed ideas about next steps to take to continue the project. They included reading a book together, writing a story together, exploring more topics, and actually visiting each other.